Selecting the best color palette for your bathroom may not just depend on your mood, house concept, or the tiles but it also be depend much on the total appearance that you wanted to have. But first you need to ask yourself whether we are looking forward to have a more relaxing bathroom. The kind of bathroom that could either be trendy, classic or eclectic; and whatever it is this must pass your taste. Whatever mood you’re up to you still end up choosing the best color you think will match your house and your character. Some people choose to have a bathroom with one color only. Some chooses to have two colors in their bathroom. Or some may customize their bathroom so they choose to have not just one or two colors but many colors that will surely make their bathroom look livelier. It is said that color can immediately affect the mood of the homeowner or anybody who will use it. So you must choose a kind of color that will make you happy and feel comfortable. As we all know that the color adds style and attitude. The homeowners who choose to have 3 or more colors in their bathroom should have to be cool and have a soothing message to the users. And today, we have collected bathroom designs with multiple colors. 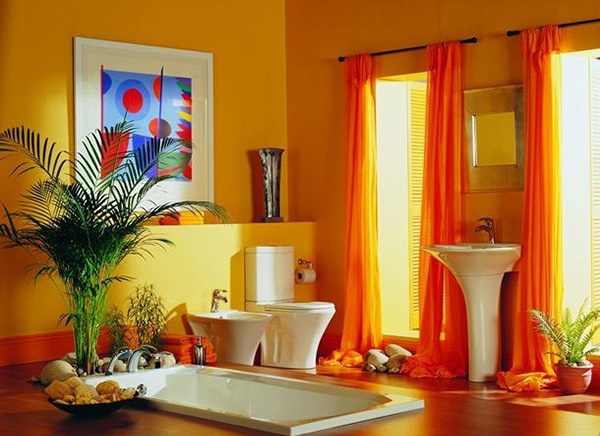 Most of these bathrooms have vibrant primary colors that may surely boost the appearance of your room. Are you ready? 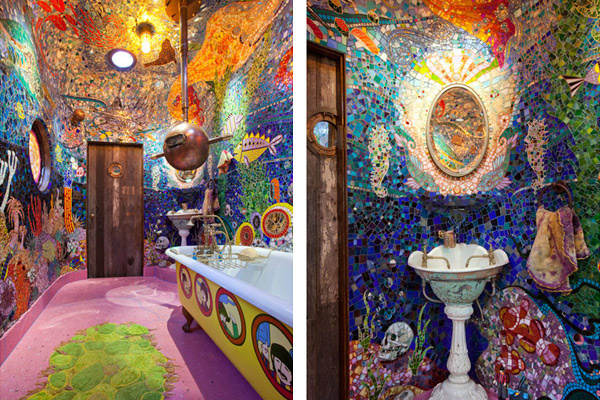 Check the images of the list of 15 Bubbly and Soothing Multi-Coloured Bathrooms below. Take a look at this amazing modern bathroom with yellow, blue, green, red, white and black paint with the different colors of lights around the mirror. The unique and attractive yellow and lavender color matched the white fixture and glass material used here to have a livelier look. Different shapes and bright colors are used here by the designer that kids will really love. The color combination used here create a different mood that will really set the mind of the homeowners to be worry-free. 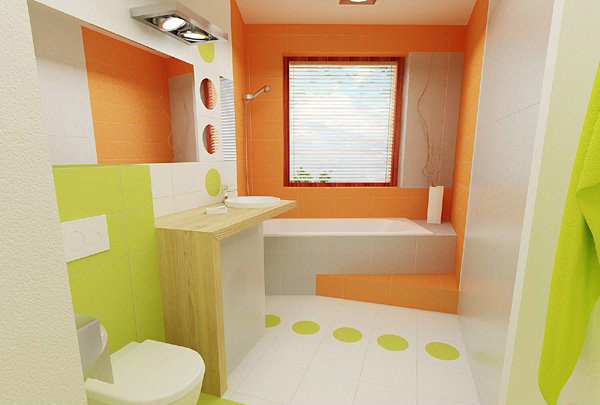 Bright colors of tangerine and apple green makes this white bathroom look cool and clean. 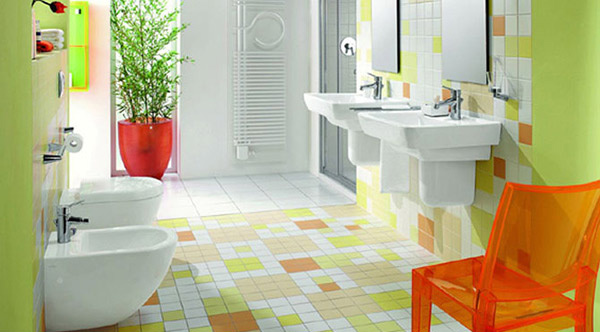 The colourful tiles are enough to make sure you will enjoy the time staying in this bathroom. 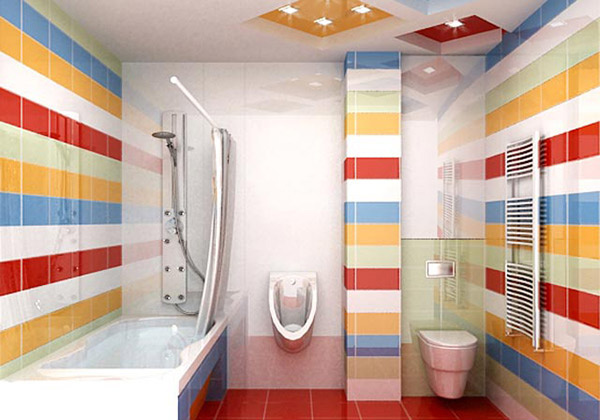 This kind of bathroom is perfect enough for teens who love colorful ideas and who are very creative as well. Mosaic tiles, with silver fixtures and white tub are enough to make this bathroom graceful. The color of this bathroom is like the golden sun that always gives us new hope and good vibes that is good enough to start the day. 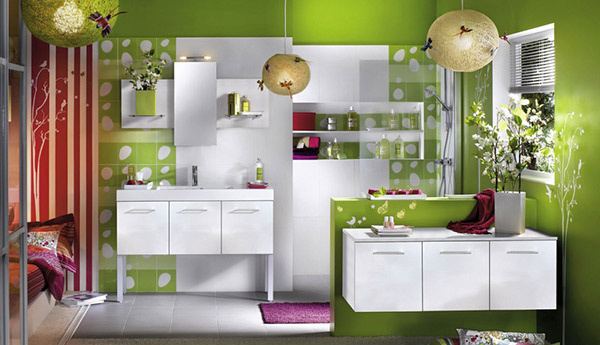 Give your bathroom a burst of colors like this one. It would surely give you a unique bathroom design. Checkered floor and walls tiles couple with apple green and tangerine chair adds more life to this clean and cool bathroom. A combination of bright and dark colors is very good to match with the wooden floorings that show us the different shades of life. 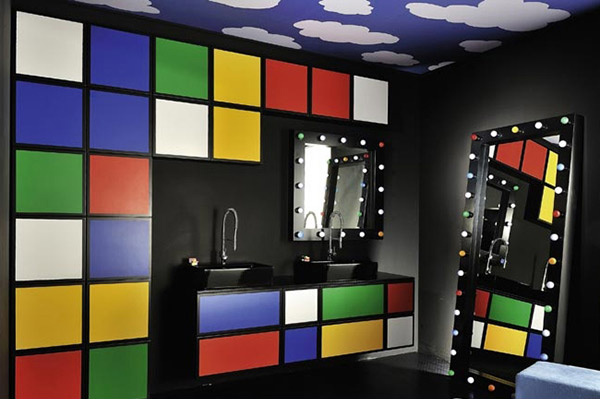 For a kid’s bathroom, this one is magical! Mosaic tiles on the wall was undoubtedly done creatively. 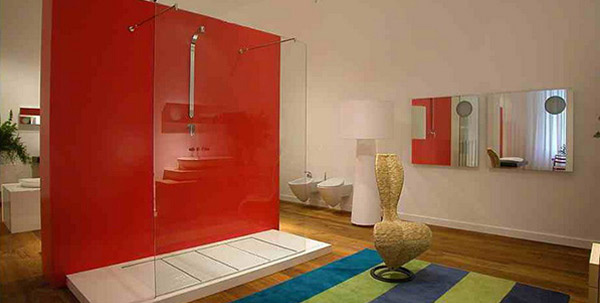 The glass material used to separate the shower area is effective to illuminate the red color of the wall to match with the rugs and white walls surrounded it. The circles of different shades gave this bathroom a retro look especially with use of violet color. 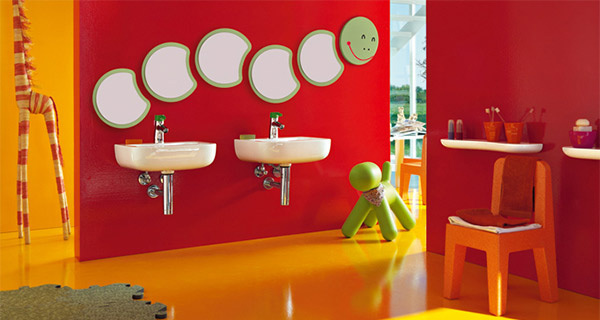 As you can see, the colourful bathrooms above display an upbeat or positive vibe. You may also see the designer’s use of neutral colors because it is said to be never out of style. They choose to partner those vibrant colors with neutral colors like brown and beige to create a sophisticated look. Colourful furniture and lightings is also an essential element in creating an energetic and soothing look of your bathroom. With that are you now thinking of renovating and redecorating your bathroom? If you are, you might as well browse into other bathroom design inspirations we have for you.